(B) The ex parte reexamination proceeding is merged with an inter partes reexamination proceeding pursuant to 37 CFR 1.989(a). If the ex parte reexamination proceeding is to be concluded as part of a merged proceeding containing an inter partes reexamination proceeding, a single reexamination certificate will issue for both proceedings; see MPEP § 2690. 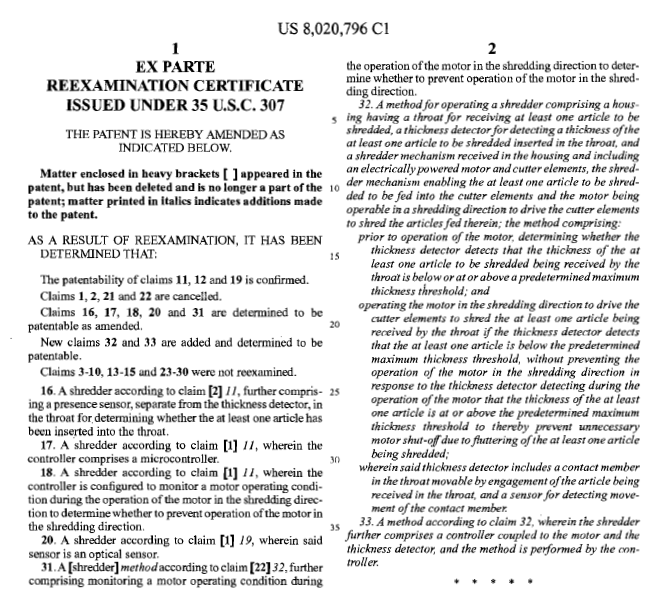 The ex parte reexamination certificate is formatted much the same as the title page of current U.S. patents. The certificate is titled "Ex Parte Reexamination Certificate." The title is followed by an "ordinal" number in parentheses. For example, if reexamination was ordered under 35 U.S.C. 304, the ordinal number may be, for example, "(235th)," which indicates that it is the two hundred and thirty fifth ex parte reexamination certificate that has issued. The certificates continue the ordinal numbering sequence that has already been established for ex parte reexamination proceedings ordered under 35 U.S.C. 304. If the reexamination proceeding was ordered under 35 U.S.C. 257 as a result of a supplemental examination proceeding, the certificate is also titled "Ex Parte Reexamination Certificate." In addition, the certificate will state "Ex Parte Reexamination Ordered under 35 U.S.C. 257 ". Ex parte reexamination certificates for reexaminations ordered under 35 U.S.C. 257 are numbered in a separate and new ordinal sequence, beginning with "(1st)." Inter partes reexamination certificates are also numbered in a separate and new ordinal sequence, beginning with "(1st)." The ex parte reexamination certificate number will always be the patent number of the original patent followed by a two-character "kind code" suffix. The first letter of the "kind code" suffix is "B" for reexamination certificates published prior to January 2, 2001, and "C" for reexamination certificates published on or after January 2, 2001. The second letter of the "kind code" suffix is the number of the reexamination proceeding of that patent, and thus shows how many times that patent has been reexamined. The next higher number will be given to the reexamination proceeding for which the reexamination certificate is issued, regardless of whether the proceeding is an ex parte reexamination ordered under 35 U.S.C. 304 or 35 U.S.C. 257, or an inter partes reexamination proceeding. See MPEP § 901.04(a) for a complete list of the kind codes used by the United States Patent and Trademark Office. The certificate denotes the date the certificate was issued at INID code  (see MPEP § 901.04). 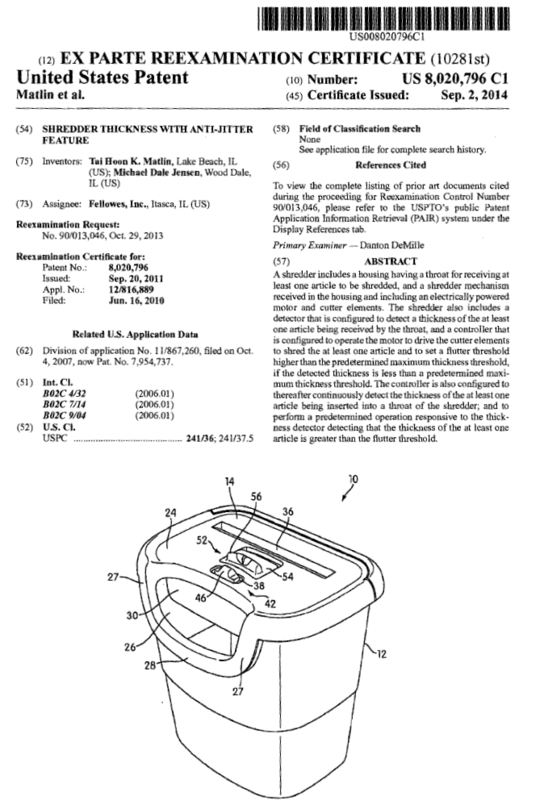 The title, name of inventor, the current classification, the abstract, and the notice regarding the list of prior art documents appear at their respective INID code designations, much the same as is presently done in utility patents. (A) The filing date and number of the request is preceded by "Reexamination Request" if the reexamination was ordered under 35 U.S.C. 304, and "Supplemental Examination Request" if the reexamination was ordered under 35 U.S.C. 257 (the control number of the supplemental examination request, which is also the control number of the supplemental examination proceeding, is identical to the control number of the reexamination proceeding ordered as a result of the supplemental examination proceeding). (C) A notice will be present which will inform that the list of cited prior art documents will be available via PAIR by control number. Finally, the certificate will identify the patent claims which were confirmed as patentable, canceled, disclaimed, and those claims not examined. Only the status of the confirmed, canceled, disclaimed, and not examined claims will be indicated in the certificate. The text of the new and amended claims will be printed in the certificate. Any new claims will be printed in the certificate completely in italics, and any amended claims will be printed in the certificate with italics and bracketing indicating the amendments thereto. Any prior court decisions will be identified, as well as the citation of the court decisions.